Hong Kong-based Bitcoin exchange 'Bitfinex' that lost around $72 Million worth of its customers’ Bitcoins last week is now offering a reward of $3.5 Million to anyone who can provide information that leads to the recovery of the stolen Bitcoins. Bitfinex revealed on August 2 that the cryptocurrency exchange had suffered a major security breach, which resulted in the loss of nearly 120,000 BTC. The hack led to a 36 percent loss for each Bitfinex customer, who will be issued tokens to be redeemed as the company is able to reimburse the losses. Now, the exchange is willing to offer 5% of the lost funds (nearly 6,000 BTC) as a reward for the recovery of the stolen bitcoins. The news came after a Reddit user, using alias someguy916, inquired about a reward Bitfinex would be willing to offer for the stolen bitcoins. In response to the question, Bitfinex community director Zane Tackett stated that a bounty would be awarded to anyone who has information that would help the exchange recover the funds. "5% of recovery and for information leading to recovery (but no bounty if no recovery); if multiple persons lead to recovery, share pro rata," Tackett wrote. 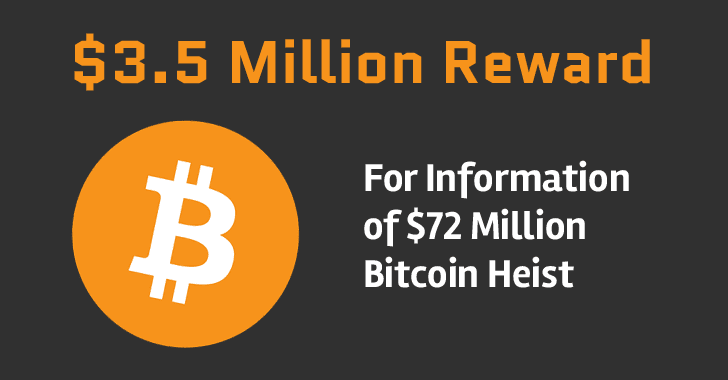 Where 5% of the stolen funds is about 6,000 BTC, which is around $3.5 MILLION. Bitfinex is the third-largest Bitcoin exchange in the world. After the news of the Bitfinex hack had broken on August 2, the price of Bitcoin dropped almost 20%, from $602.78 to $541 per Bitcoin, within the day after the announcement. "We have added additional platform and infrastructure security checks; regenerated all encrypted services, including wallets, security tokens, and passwords; moved funds to multisig cold storage; re-evaluated all third-party integrations; performed a comprehensive system audit in order to identify vulnerabilities; and, rebuilt our entire platform on new infrastructure." The best way to secure yourself from such hacks is to keep your Bitcoins OFFLINE. The safest place to store your Bitcoins or any other digital currency is in on your own (if possible, offline) wallet; instead on any website or cryptocurrency exchange.